As warming and comforting as sweet breakfasts can be, I often crave something really crisp in the morning. You may think salad for breakfast sounds crazy, but I promise it’s the most nurturing thing to start off your day. 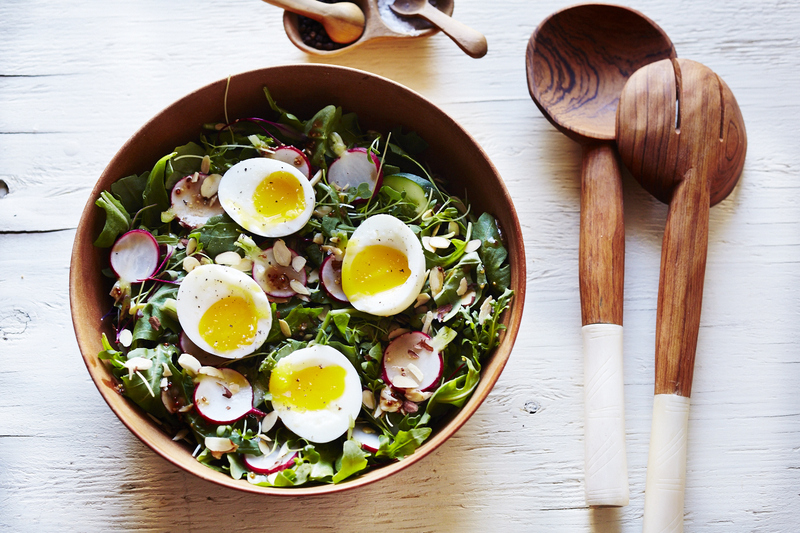 Especially if you’ve maybe had one too many glasses of wine the night before – this salad will surely bring you back to life. 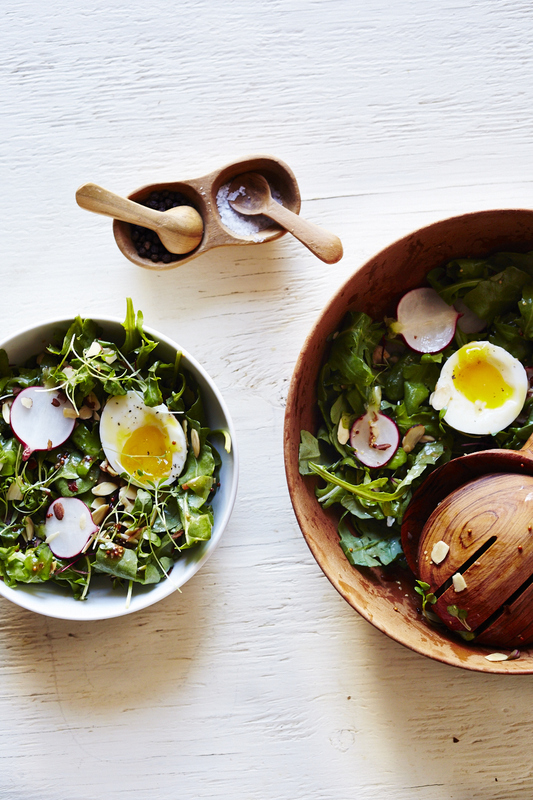 The peppery arugula and runny egg is like a wheatgrass shot to your system. Sometimes I’ll throw in some avocado or even leftover quinoa – whatever you have in the fridge will work. Top it with an egg (poached, soft, fried – you choose) and you have the most satisfying, light and savory breakfast that couldn’t be easier to throw together. Prepare a small bowl with ice water. In a medium saucepan, bring 4-5 cups of water to a boil. Once boiling, carefully add eggs (making sure they are completely covered with water), then boil for exactly six minutes. Remove from heat and add to a ice bath. In a small jar or bowl, whisk together first four dressing ingredients. Slowly drizzle in olive oil, whisking while you pour. Season with sea salt and freshly ground pepper. 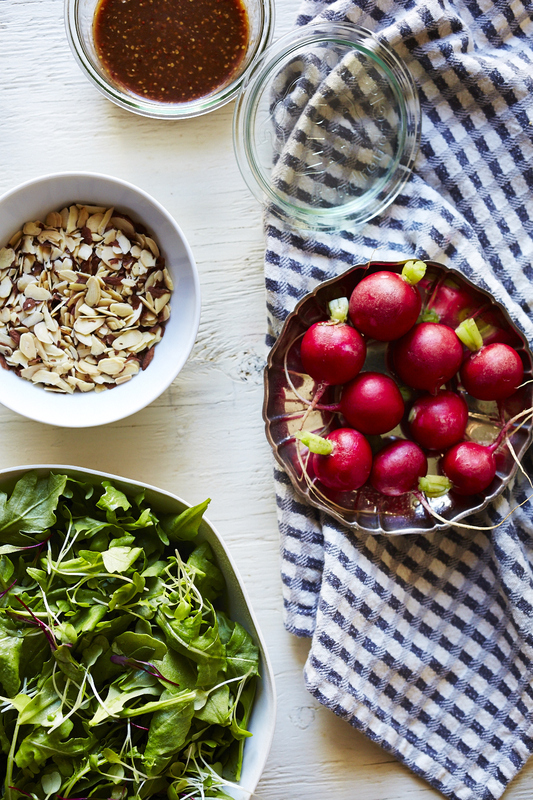 In a large mixing bowl, add arugula, radishes, cooled + sliced almonds, and shaved parmesan. Dress greens, using your hands to coat well. Add (carefully) shelled soft boiled eggs to top, and enjoy! The salad looks super delicious! I made this and it came out great! Excellent directions. Question: the radishes and almonds clumped together even after mixing everything together, how do i prevent this in the future?